The first successful iteration of John Garand’s rifle was developed in 1921 and refined through 1924. A small batch were made for US military testing in 1924, where it was compared to guns like the Bang, Hatcher-Bang, and most significantly the Colt/Thompson Autoloading Rifle. Garand’s rifle was primer-activated, with a downward-tilting locking lug at the rear of the bolt (like an 1886 Mannlicher). It was the clear willer of the trials, but was rendered useless in 1925 when the military adopted a new loading of .03-06 which used IMR powder (with a substantially different pressure curve than wha tGarand had been using for his design) and staked primers – which rendered it thoroughly unusable in the 1924 Garand. In response, Garand would completely change his design, moving to a rotating bolt with two symmetrical locking lugs and a long stroke gas piston – which would eventually be adopted as the US Rifle M1. 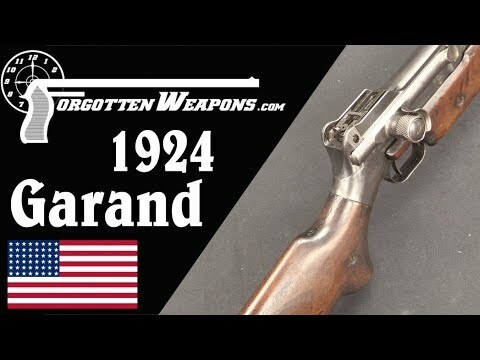 However, Garand’s skills as a rifle designer are clear in this 1924 prototype – it handled and balances wonderfully, and has excellent sights and trigger. It disassembles easily, and simply feels robust and svelte in a way that is quite unusual for early semiautomatic rifles. Pressure Is Mounting! Major Publication Calling Feinstein To Tell The Truth!